Create, share, chat and pay. WeShare makes it easy to keep track of expenses. Create, share, chat and pay. 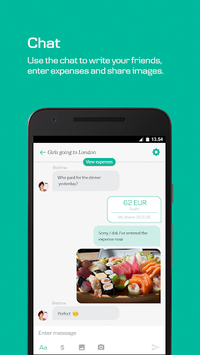 With WeShare it becomes easy to keep track of planning and expenses, when you go on a city break or a festival with friends, want to keep track of costs on the shared apartment, arrange a bachelor party or anything else where you are more on spending. You can also chat together in the app and share photos and emojis. It has never been easier to split the bill and sharing expenses on the go. 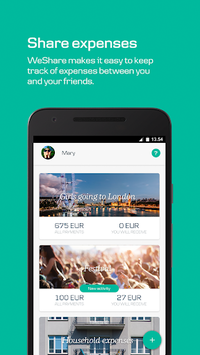 WeShare is the perfect app for holidays, café visits or shopping trips. Create and name groups and update regularly your expenses inside the app. WeShare keeps track of accounts, so you can settle immediately - and it is quick and easy with MobilePay. In order to use WeShare you must have a Danish or Finnish cell phone number. Login with MobilePay or phone number and you are good to go. Create a group, name it, upload a nice looking event image and add your friends quickly and easily via the phone. You can continuously enter your expenses and let WeShare keep track of who owes what. 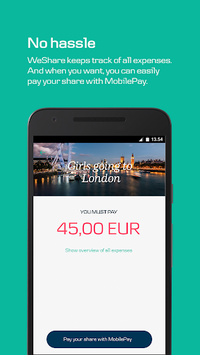 Add expenses and settle easily with MobilePay.